Our next term starts on 12th of January and ends on 15th of June 2019 for all our kids classes, except for musical theatre, which will start on January 6th and ends before Ramadan. We are now accepting registrations for new and returning students. Many of our classes were full last term so register early to avoid disappointment. To register contact us at 04 447 0773 or info@jamesandalex.com. If you have any inquiries or would like more information about our kids’ classes, call us at 04 447 0773 or contact us by e-mail. Spaces are limited. No space is guaranteed until fees are fully paid in advance. Payments can be made by cash, credit card or cheque. 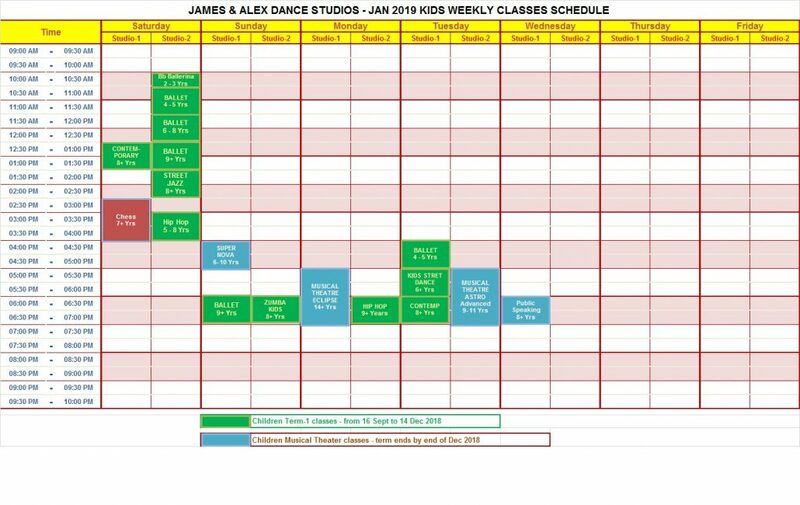 Registration can be done over the phone, in person at James & Alex Dance Studios, or by e-mail. Please note that no space is guaranteed until fees are fully paid in advance. Receive a 10% discount on your child’s dance uniform throughout the term (applies to leotards, tights, and ballet shoes).